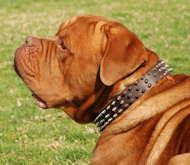 A collar is intended for leash attachment, dog identification or just to decorate the pet. 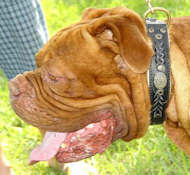 Such item should be durable, dog-health safe and pleasant to touch. 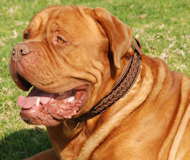 It is meant to be worn on one of the most sensitive parts of the canine's body, therefore, one should care a lot when choosing this gear. 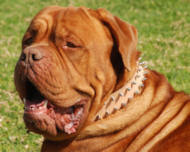 In this category, you will find the products that will make your Dogue de Bordeaux look magnificent! They are made of the different stuff, have various design and will just amuse you with their quality and reliability! 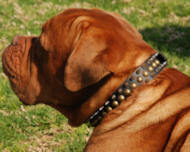 Hasten to find the collar that will suit your canine the most! 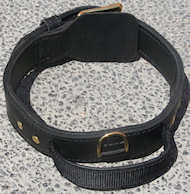 Model: C31##1034 Leather dog collar "Yellow stars"
Model: C30##1034 Leather dog collar "Silver-like Stars"